This week, I began an exciting project to find the meaning of Aloha. I gathered my information from many sources: All ages. Local non-Hawaiians. Hawaiians. Tourists and Malihini, transplants to Hawaii. In an unexpected twist, when I spoke with the elders, they had very little to say. Their answers were very simple. Consistently short and simple. People in my generation and older, the Makua, had a very scholarly interpretation. An expressive, articulate interpretation of the word aloha and what it means to them. In a discussion with my cousin about my observation she said, “You know, it’s because our kupuna, elders, they lived aloha. It wasn’t even something you needed to talk about. Aloha was just a part of you. Something you were raised with. How you lived. A way of being. In this generation, Aloha is something you are. Aloha means to be in the presence. When we are in the presence or spirit, we radiate the divine in everything we do, everything we are, and everything we say. Since great spirit is love, when we embrace that truth, we open ourselves to serving with love. It influences everything. Aloha is the breath of life. It gives us purpose. It forever will be and has always been a part of who we are. We can connect to Aloha and extend it to everyone in any situation. Venerate? I didn’t even know what that meant! Venerate means to uplift, to lift up or raise up. We can raise ourselves up with love or aloha. We can raise others up with love or aloha. We can help each other to be more and to be better, to be more closer to the spirit that we truly are. This was fascinating because the explanation came from a visitor. It’s the experience of being welcomed, loved, and accepted as family instantaneously. Not after a period of time of getting to know someone, but instantaneously and unconditionally. It’s a feeling that is projected from the people here. Aloha is just a way of life. Aloha encompasses the values of malama, to care, nature or be caring. Lokahi, unity. It also has to do with your character, something that’s instilled in you. Ha’aha’a, humility. Kokua, being helpful and of service. It is pono, being in alignment and balance with yourself and with all things. The combined experience of these values instilled in one’s character is the living and being in aloha. Aloha is the sense of peace, beauty, wellbeing, and genuine kindness that comes when we respect ourselves, everyone else and all things. It’s greeting people with kindness, even just the smile. That is aloha. It’s doing what is right in humility. One of our kupunas, Auntie Bernadine, says this is the only way. You have to love yourself in order to have the capacity to love others. Then, you can give freely with acceptance, no matter the race, religion or creed. It’s not just a word. It’s an embodiment and a feeling of warmth and oneness. Aloha is compassion and love that we can be embraced by. Aloha is something we all want. A gift we can cultivate. Take a moment to draw in that divine breath of God. Take in the presence of spirit and acknowledge that spirit within you. As you acknowledge that spirit within you, understand aloha is an embodiment. A way of being. A way of living. It’s a feeling. An emotion. Something we can extend to others. As you bask in the present, allow that aloha, that love, that unconditional aspect to embrace you in warmth. Having respect for yourself and others, bringing in a reverence of that divinity and allow yourself to extend and expand. It has always has been a part of us and is our birthright. We can extend it out to help illuminate and ignite that same feeling and presence in others. 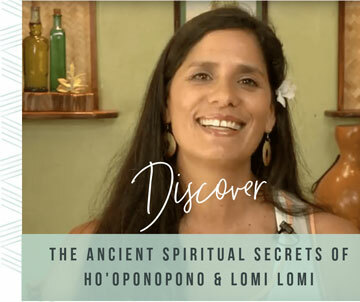 Help others remember who they are as true embodiments of this spirit of aloha. I want to mahalo, thank, all of the people who shared their mana’o, knowledge and insights, with me. …better yet, just take your cellphone and make a quick video of what aloha means to you. I’d love to compile it and start sharing it on our Facebook platform or share it with students in our Lomi Lomi retreats. When we put our hearts, thoughts, and minds together towards this very positive aspect of who we are as being. In the presence of spirit. Living aloha in action, in words, in service…we can help others to also expand in the aloha they already carry within. Send me your videos from wherever you are on the planet. I can’t wait to hear it, see it and share it!